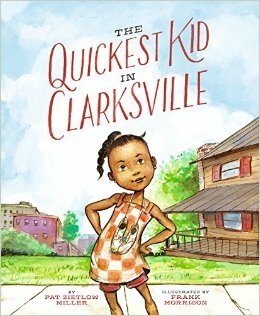 The Quickest Kid in Clarksville, written by Pat Zietlow Miller and illustrated by Frank Morrison is a story of competition, friendship, and teamwork framed by a homecoming celebration for three-time Olympic gold medal winner, Wilma Rudolph. It's 1961 in Clarksville, Tennessee, Wilma Rudolph's hometown and Alta is practicing to be the fastest women in the world. Then Charmaine shows up, "strutting hard enough to shame a rooster" with "brand-new, only been worn by her shoes with stripes down the sides and laces so white they glow." 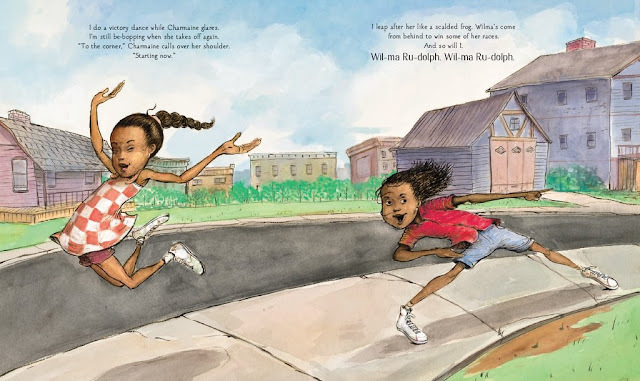 Charmaine's daddy went uptown to buy them and they are just like Wilma Rudolph's. Alta doesn't have a "shoe-buying daddy" and her sneakers have holes in the soles. An instant rivalry leads to a challenge. Alta knows that shoes don't make you fast - after all, Wilma wore a "leg brace and a flour sack dress before she got big." The girls race, feelings are hurt and knees are skinned. 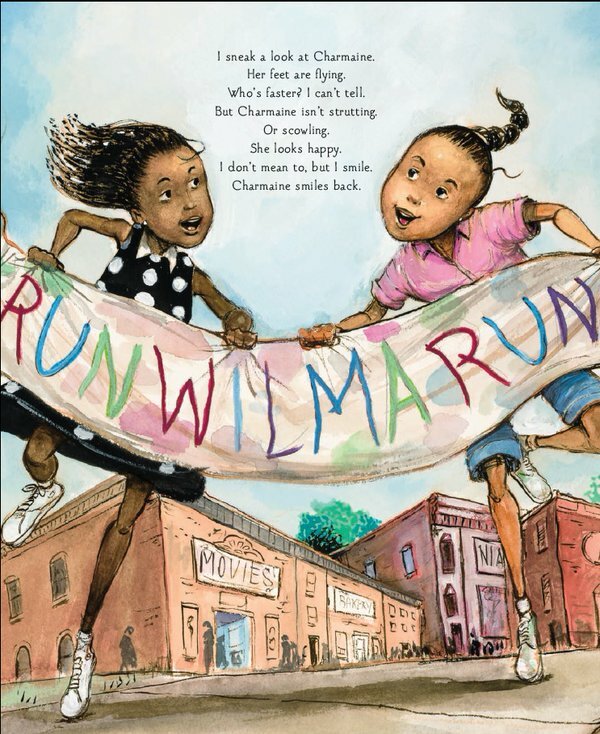 But, when it's time for the parade and Alta is racing to get her banner to the parade route, Charmaine joins her and the do it like "Wilma's relay. Three people ran it with her, you know." The relay team makes it and are in front of the crowd in time for Wilma to see them and smile and wave, making the girls, "sashay like we own the sidewalk and everything on it. And maybe - just maybe - we do." 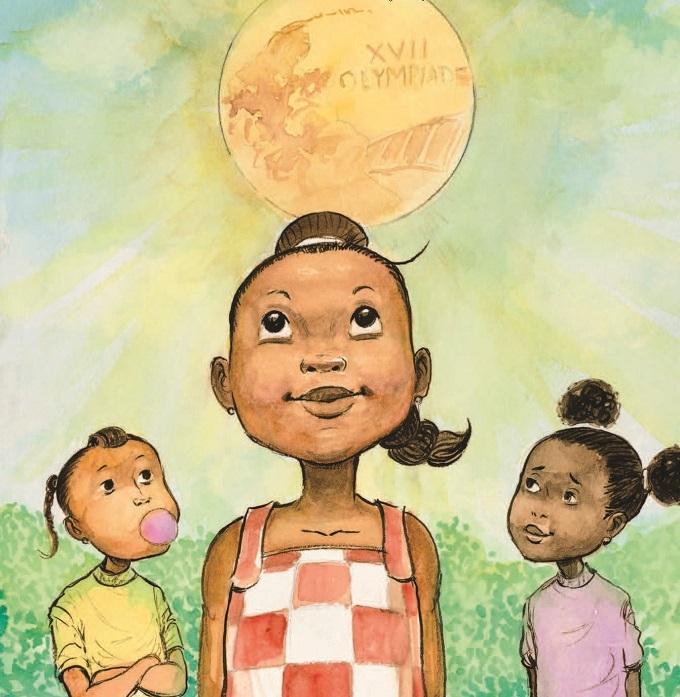 The author's note provides great information about Wilma Rudolph and her Olympic wins. What is especially interesting is the fact that, when Clarksville wanted to honor her with a parade and banquet, Rudolph said she would not attend unless events were integrated and open to everyone. The organizers agreed, and the celebratory events for Rudolph were the first major events for blacks and whites in Clarksville history!